Paperback, 6.5 x 9 in. / 200 pgs / 80 color / 6 duotone / 5 bw. Edited with text by Lucía Sanromán, Susie Kantor. Text by José Luis Falconi, Grant Kester, Suzanne Lacy, Cuauhtémoc Medina, Peggy Phelan. 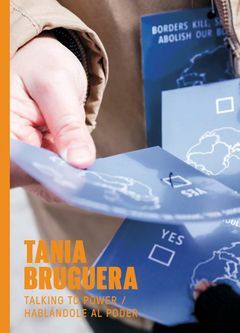 The work of Cuban artist Tania Bruguera (born 1968) researches and performs the ways in which art can be applied to collective everyday life, focusing on the transformation of emotion into political action. Talking to Power / Hablándole al Poder surveys Bruguera’s artworks for the public sphere created between 1985 and 2017, all of which position art as a resource for social change. This collection of works offers the reader a deep understanding of the artist’s strategies for intervening in power. Richly illustrated and including rarely seen documentation of Bruguera’s actions, this volume features texts by José Luis Falconi, Grant Kester, Suzanne Lacy, Cuauhtémoc Medina and Peggy Phelan. FORMAT: Pbk, 6.5 x 9 in. / 200 pgs / 80 color / 6 duotone / 5 b&w. Published by Yerba Buena Center for the Arts.